Excellence is a term that is very popular within the management circles. 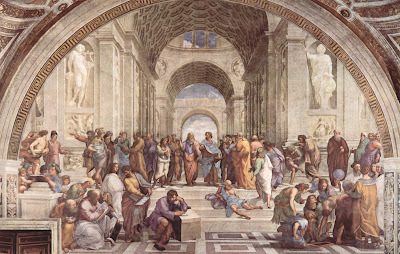 When I learned that my department was reorganizing into a center of excellence I imagined something like Rafael's School at Athens. How wonderful! It would be where we, the developers, could discuss our trades amongst the other developers and focus on how to develop excellently. I can see myself there in the middle. Eureka!!! I am Socrates! Excellent! And there's that guy on the right from the Guns 'n Roses Use Your Illusions I and II albums. I bet he's rocking. Excelsior! We learned that we were siloed development units. As a developer, I had no idea who any of the other developers were and which of them worked with the same technologies as us. Then it happened. We reorganized into the CoE. I wouldn't describe it as being all that excellent, even though we're in the center of excellence. We're now more like interchangeable parts than software developers. The project managers request us by our skillsets and then our resource managers assign us to projects. We're agile, fluid, and excellent. We're lots of things if you ignore the meanings of words. We're told that we shouldn't support applications, but when something needs to get done, those of us with the knowledge to support them are all in the CoE. What I believe is actually happening is the people in the finance department have figured out that when we do one type of work they can categorize it as a capital expense, as something that adds value to the company, when we do maintenance type work, they categorize it differently and it doesn't show up as additional value to the company. Weird huh? Ignoring the problems with the company software and creating more software actually makes the company worth more than making the existing software work better ipso facto, developers are discouraged from spending any more time fixing bugs than is absolutely necessary. We, the developers, are accustomed to providing service to our business users. When their tools are broken, we fix them, and they appreciate it. Now we're told that we need to minimize that. The correct way of doing business is to not speak with them directly, instead let the project managers handle the business users. We're silage again. Now, instead of being siloed from our peers, we're separated from our customers. Excellence, now conjures up a different image to me. It's a torus or a hurricane. At the center of excellence there is nothing. 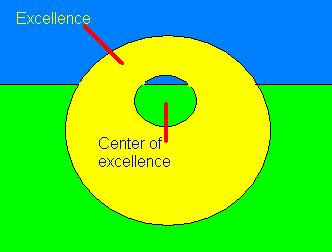 It's like the excellence surrounds the center, but within the center it is devoid of the excellence.